The night passed quickly and it was then the first day of neoschool. Quiltelta walked through the front door of school wearing a Uni garden hat, a school girl shirt, and overalls. Finally she got to go to neoschool, but she wasn't as excited as she was weeks ago. She knew that the Neopians in Faerieland were different than her, in fact, much different. She then saw Marie, the mutant Usul, wearing a... Jack-O-Lantern Pail? The brown Uni walked over to Marie and softly asked her, "Why are you wearing that Jack-O-Lantern Pail?" Marie smiled. 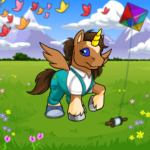 "I'm pretending it's Halloween so other Neopians think I'm dressing up and that I'm really not a mutant! Then I'll be POPULAR!" "But don't people already know who you are?" "Not if I pretend I'm new!" "Well, won't they wonder why you're in a costume every day?" "Oh, well, about that." Marie took out a faerie paint brush. "I'm going to paint myself during gym!" Quiltelta sighed when she saw that Marie had a paint brush, she thought that Marie would become popular without her. It was right before lunch when gym started, and Quiltelta sighed, but she then thought on the bright side, maybe the group of popular Unis didn't go to this school? But she was wrong; right when she thought that sentence, the same Unis from the park were walking into the gym. Quiltelta glanced over at Marie. She had gone to the Rainbow Pool right before gym and had come back as a faerie. There was a crowd of popular girls from all over the school talking to her; there was no way Marie would be her friend again. Quiltelta got dressed into her gym clothes and walked back into the basketball court. She saw Reagan and Meagan fighting over one of the balls, but the gym teacher, a desert Lutari, came over and took the basketball from them. "All right, girls and boys, the teams are simple for dodgeball, popular VS un-popular!" the Lutari shouted to the gym class. Quiltelta scowled at the teacher and sighed. Reagan and Meagan slithered over to her. "Don't worry, we're un-popular too!" Meagan said happily, then frowned when Reagan scowled at her. "What did I tell you about your manners!" Reagan yelled at her sister. "We're good at this. If you don't get hit, they might like you!" When the mutant Hissi sisters weren't looking, Quiltelta rolled her eyes at Reagan's nonsense. She jumped in fright as the gym teacher blew his whistle, and of course, right when it blew, the royal Uni leader of the popular Uni group smacked a dodgeball right in Quiltelta's stomach, knocking her down. "You're out, Quiltelta!" the gym teacher shouted at her blowing his whistle. Quiltelta walked over out of the court and sat down angrily. "It's alright, Quiltelta, we will win for you!" Meagan said happily to Quiltelta, but then a dodgeball hit her on the back. "MEAGAN!" Reagan screamed at her sister. "This is ALL your fault! We had a chance to be-" The gym teacher whistled at the sisters. The mutant Hissi sisters fought there way out of the court and sat down next to Quiltelta angrily. Quiltelta glanced at Marie. In front of her on the un-popular side was a male zombie Krawk staring at her and yelling brains. Quiltelta was extremely happy when gym was over, she skipped happily out of the gym as the bell rang. She walked over to her locker and took out her lunch. Everyone else was already at lunch, or so she thought. She heard familiar screams, but she shrugged and went down to lunch. When Quiltelta got down to the cafeteria, she sat down next to Reagan and Meagan who were, for the first time, not fighting. Well, until Quiltelta sat down. "I want to sit next to Quiltelta!" Meagan yelled. "You made us lose in dodgeball, I get to sit next to her!" Reagan screamed back. Quiltelta sighed as the sisters continued to fight. She slowly ate her lunch, then she saw the Uni group at the table next to her. They laughed and laughed as the zombie Krawk came down from the lockers. They then tossed him a... pirate paint brush? How can they afford it? Quiltelta thought to herself. She stood up and walked over to the Unis. "How did you guys afford that?" The royal Uni and her friends turned around to look at Quiltelta. "Well, it looks like farm girl decided to go to school!" Her friends laughed with her. "Why did you give him that paint brush?" Quiltelta yelled at them, ignoring their teasing. "Well, let's just say he did something for us, so we could bump a certain popular Usul back to the un-popular place where she belongs!" Quiltelta's eyes grew very wide as she heard the Uni say that. She pushed the royal Uni's lunch tray onto their new NC mall dress. The Uni and her friends gasped. The royal Uni stood up and pushed Quiltelta to the ground. Holding her there, she took out a Uni transmogrification potion. "I was going to let my zombie Krawk friend there do this, but it looks like I have to do it myself!" She popped off the cap of the potion and spilt it down Quiltelta's throat. She laughed as the brown Uni morphed into a mutant Uni. A faerie Poogle teacher began walking over to them. The royal Uni quickly pushed Quiltelta away while the teacher wasn't looking. "Jess, what are you doing?" the teacher asked the royal Uni leader of the Uni group. "Oh, nothing, I was just telling my friends here a few jokes," Jess said innocently. "Well, please keep your voices down, the cafeteria is getting pretty noisy!" The faerie Poogle teacher began to walk away. Quiltelta ran up the stairs to the lockers. She heard quiet crying. She walked over to a row of lockers, and there Marie was crying away. She had been morphed into a mutant just like Quiltelta. "Marie!" The mutant Usul looked up at the mutant Uni, not knowing it was Quiltelta. "What do you want?!" she shouted. "It's me," Quiltelta said softly. "Quiltelta." "The zombie Krawk morphed you too?" "Not really. Jess was behind it all; she gave the Krawk a pirate paint brush to morph us into mutants." "Everyone was paying attention to you, and not Jess and her friends, so she got mad." "What are we gonna do, it took forever to get that paint brush!" "Trust me, I have a plan." Quiltelta grinned at Marie. The next day during math, Quiltelta took a straw and crumbled a piece of paper inside it, she then spit it through the straw and hit Jess in the head. Jess, the royal Uni, looked around the classroom trying to found out where it came from. She shrugged and un-crumbled the paper. It read, "You don't know who you're messing with." Jess snickered and spit another paper note at Quiltelta, but the brown Uni ducked her head and it hit the teacher. Jess's eyes grew wide and she hid her straw and continued to work on her paper. The Yurble teacher un-crumbled the paper note and it read, "I know who I'm messing with. You better watch out, I have more of those potions to mess with your other friends!" "Who wrote this?" the teacher shouted to her class. When no one answered, she screamed her sentence again, "WHO WROTE THIS?!" Jess pointed to Quiltelta. "She wrote that to me!" "WHAT?!" Quiltelta stood up out of her chair. "Quiltelta and Jessica," the teacher began. "Go to the principal's office at once!" Quiltelta angrily walked out of the classroom while Jess happily skipped out. "Trust me," Jess began to say. "I know who I'm messing with!" They eventually arrived at the principal's office. There was a desk with a royalboy Skeith sitting behind it. On the desk it read, "Mr. Heinbe". Mr. Heinbe stood up angrily. "And what are you two Unis here for?" "Jess lied-" Quiltelta was interrupted by Jessica. "Quiltelta passed me a note and said she was going to morph all my friends into mutants! She already did to my dear brother, and now I don't know what to do!" "I did not-" She was interrupted again. "Quiltelta, is this true?" Mr. Heinbe asked Quiltelta. "She's-" Quiltelta stopped when she saw Jess glare at her. "Yes, Mr. Heinbe, it's true." "Jessica, please head back to class. Quiltelta, come in the other room with me." Mr. Heinbe closed the door behind them and glared at Quiltelta. "You are suspended from Rainbow Wings Neoschool for two days. Do not come back until then." He then sent Quiltelta back to class. Once she arrived, everyone was staring at her. "Everyone, get back to work!" The teacher slammed her ruler on her desk. All the students headed back to work, and Jess snickered as Quiltelta sadly began her work.